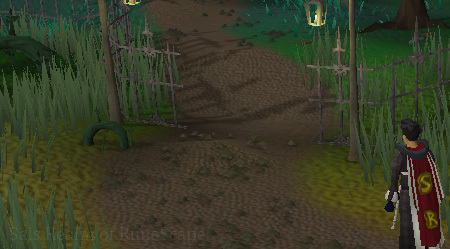 Canifis is a dark and spooky city located east of Varrock in the kingdom of Morytania. It is a city that is only accessible to members. There are multiple ways to get here, which will be explained later. All methods will require completion of the quest, Priest in Peril. In the city, you will find a bank, a pub, a taxidermist, a clothing shop, and much more! First of all, in order to enter Canifis, you need to complete Priest in Peril. 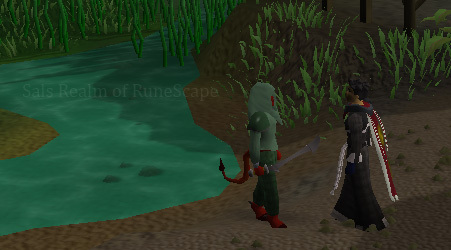 Once that quest is green in your quest booklet, you may enter Canifis. This method is the basic and simple way. Exit Varrock through the east and head north. Follow the fencing until you find a gate. Open the gate and follow the path to a temple. Head north of the temple to the entrance of the Paterdomus Dungeon. Navigate your way through the small dungeon and exit through the holy barrier. This method also requires the completion of Priest in Peril and level 65 Agility. Agility potions or any type of agility-raising item will not work. When you arrive at the temple, head south and follow the new path. 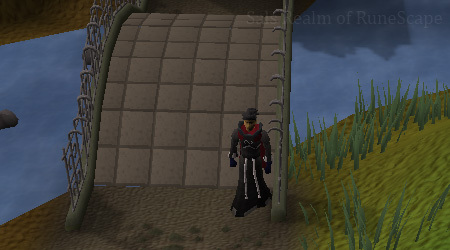 You will come to an agility shortcut in the fencing. 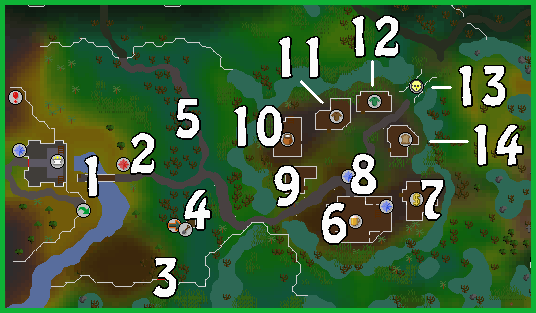 Use the shortcut to be taken down into Morytania. Walk to the bridge and then make your way to Canifis. This method is only for players who have started the quest, A Fairy Tale Part 2: Cure a Queen. 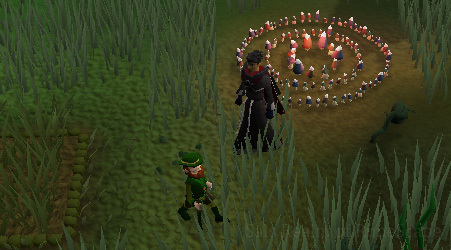 From Zanaris, use the Fairy Ring code "CKS" to be teleported near a Mushroom Patch. Head northeast of this patch and you will enter Canifis. This method is only for players who have completed the quest, Desert Treasure. With your Ancient Magicks equipped, use the teleport spell "Kharyll Teleport", requiring two law runes and one blood rune. You will be teleported in the center of the Canifis Pub. This method is only for players who have a house, a portal room, and completed Desert Treasure. Build a portal in your portal room and set it up for unlimited teleports for Kharyll. This will require 200 Law Runes and 100 Blood Runes. Once the portal is set up, you can use the "Teleport to House" spell and use your new portal. This method is one of the fastest ways to access Canifis. This method is only for players who have completed the quest, Ghosts Ahoy!. With the Ectophial you are rewarded, empty the vial to be teleported to the Ectofuntus temple. Exit the temple from the north and walk west, past the farming spots and Fenkenstrain's Castle. Soon you should find a gap in some fencing. Walk southwest of this gap and enter the city. As you enter Morytania and Canifis, you should notice that there are multiple level 24 Men and Women wandering around the city. They are not as weak as they seem. If you attack them, they will transform into a level 88 Werewolf. If you attack with the Wolfbane dagger, they will stay level 24. Once you have navigated though the Paterdomus Dungeon, you will arrive here. This is the entrance to the kingdom of Morytania. To the east is the city of Canifis. Canifis will be explained with more detail in just a little, but before we explore it, fully cross the bridge to view the start point of an Activity. At the end of the bridge is an area surrounded by different NPCs of different combat classes. These people are part of the Burgh De Rott Ramble Activity. The Activity is associated with the Temple Trekking Activity, and it is basically the opposite: you lead citizens to Burgh De Rott instead of away from it. If you are interested in playing this Activity, make sure you are well prepared and have completed the following five quests: Priest In Peril, Nature Spirit, In Search Of The Myreque, In Aid of the Myreque, and Darkness of Hallowvale. South of the entrance bridge is a gate that leads to the Morytania Swamp. In order to enter the swamp, you need to have started of the quest, Nature Spirit. Ulizius will prevent anyone from entering the swamp unless the quest has been started. 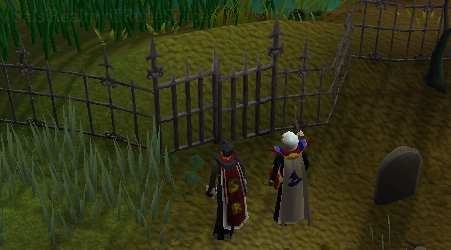 If you look west of the swamp gate, you will notice some level 42 Ghouls. They are aggressive to players with a combat level below 85. Northeast of the swamp gate is a Farming patch and a Fairy Ring. The farming patch is used to plant bittercap mushrooms, which require level 53 Farming. The Fairy Ring can only be used by players who have started A Fairytale Part 2: Cure a Queen and are wielding a Dramen or Lunar Staff. To get to this ring via Zanaris, use the code "CKS". North of the Farming Patch and Fairy Ring is another trail that leads to the Canifis Slayer Tower. The tower is filled with certain Slayer monsters that can only be found there. There are certain requirements and items necessary to kill certain monsters. Make sure you are properly prepared. In the pub, you can find many exciting things. First, you can find Roavar. He is the owner of the tavern. He also sells Moonlight Mead for 5 coins. On the west table of the tavern, there is a jar filled with pickled brain. The brain is used in the quest, Creature of Fenkenstrain. You cannot eat it, but if you want to buy one, it costs 50 coins. Near the entrance is Malak. He is a vampire and plays a part in the quest, Desert Treasure. East of Malak is Vanstrom Klause. Vanstrom plays a part in the quest, In Search Of The Myreque. If you have completed that quest, then a Stranger will replace Vanstrom's place. South of the tavern is a trapdoor. 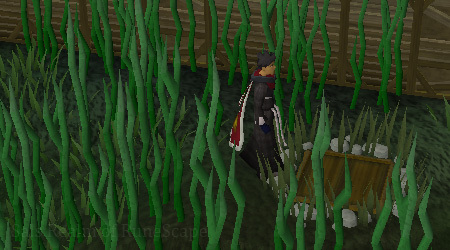 This trapdoor leads to a secret passage that will take you to the Morytania swamp. In order to use this secret passage, you'll need completion of the quest, In Search Of The Myreque. As with most cities, here you can find a bank. The bank serves the same purpose as every bank: storing and withdrawing items. 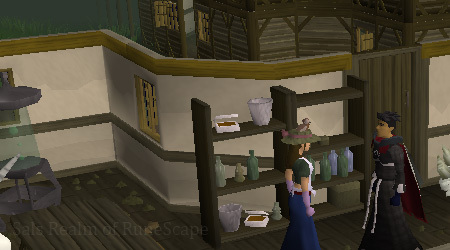 This bank is useful to gather supplies if you are about to go play Barrows or if you would like a nice place to alchemize items. West of the bank and north of the tavern is a signpost. Reading this signpost will start the quest, Creature of Fenkenstrain. If you have completed the quest and read the sign again, it will read, "AAARRGGGHHHHH!!!!!". Whenever you slay a monster, chances are that it will drop bones and an item. Sometimes, you may be lucky enough to find a part of the dead monster, such as a head. Sometimes when fishing, you will catch a larger version of the fish you are fishing for. If you obtained one of these items, congratulations! 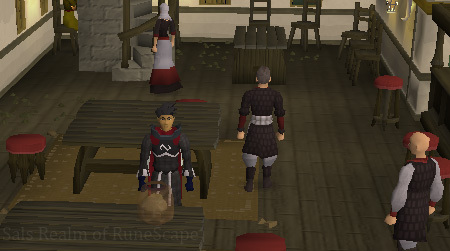 You have received a special item that can be mounted in your Player-Owned House Skill Hall. However, you cannot immediately mount the head/fish. You will need to take it to the Taxidermist, and for a certain price, she will stuff it for you. You can now mount it on a wall in your Skill Hall (requires level 25 Construction) to show off to your guests. The general store in Canifis is slightly different than the regular ones. It sells the basic items every general store sells, but it also sells some items that cannot usually be found in other general stores. Players who are fond of the Crafting Skill will find this building useful. Here you can take different hides from Dragons or Cows and give them to the owner, Sbott. For a price, he will tan them for you. 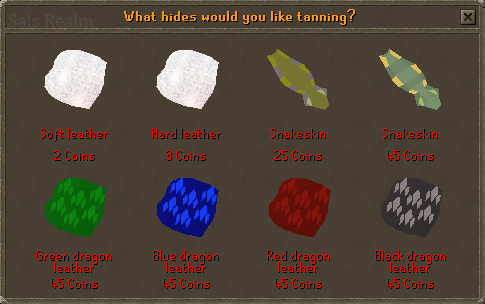 You can craft tanned hides into different items. This is the clothing store where you can buy different color robes, boots, gloves, and hats. 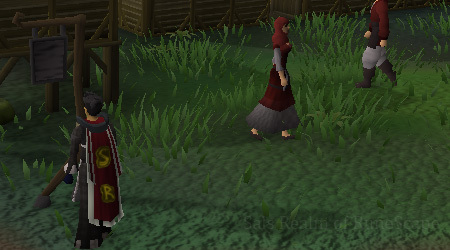 Capes and gloves are tradable to any f2p person and to any member. This makes the colored gloves popular in free worlds due to their unavailability. The colors come in gray, red, yellow, blue, and purple. In the northeast exit of Canifis, near the Clothing Shop, you can find Mazchna. He is the level 2 Slayer Master. 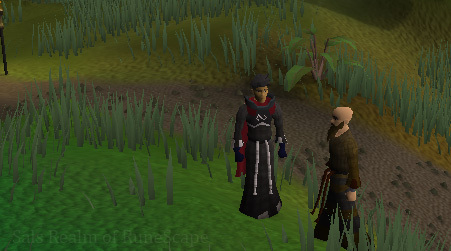 He has no level requirements to train from him, although the tasks he assigns are more difficult that Turael's. 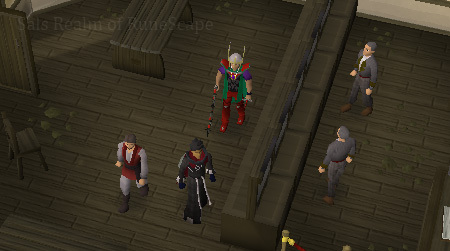 As with every slayer master, he also has a slayer shop to buy basic and advance slayer equipment. Southeast of the Clothing Store is a meat emporium. This store only sells foods that are considered meat products. The meats range from animals to fishes.